Are you properly shifting weight and balance in a convincing way? Is there a clear and consistent sense of mass to the character? Are you effectively using principles of Anticipation, Timing, Ease In/Out, Arcs, and Posing? Module 10 - Remember the Bouncing Ball? At it's core, this is the same notion with some small differences. As long as well have good Arcs, proper Ease In/Out at the apex and Squash/Stretch (in the posing, not deforming the ball itself.) The results on this assignment should be great! First start by auditing the RIG and making sure you know all the controls and how they function. Try a couple of useful poses as well - a crouching (squash) pose and a fully extended leap (stretch). Now that we have a handle on the rig, start your planning. 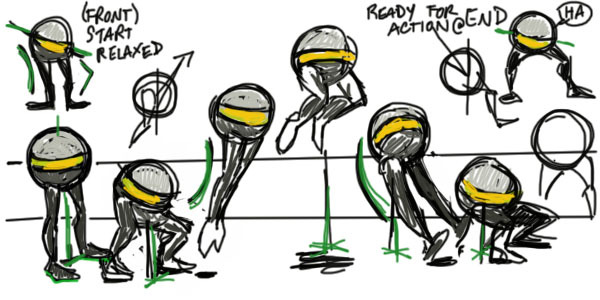 You can rough out some thumbnail sized sketches of the action, search online for some standing jump reference, or shoot some video of yourself leaping. Any one of these methods should work. If you're using video, remember to trim down and analyze your clip or all that effort is not going to help at all. Here's my plan for this assignment with a quick sketch of each main key pose. I also included some lines to suggest line of action and the character's balance. As you can see, pretty drawings are not needed here. Start laying in your key poses in 3dsMax (about 7 in all). You should have a relaxed starting pose, a crouching anticipation, a fully extended leap, the apex of your jump, stretching to land, squashing impact and the final position. First the Exaggeration: I'm taking a second pass at my scene, starting with my key poses. I'm looking for places to push the poses further. I lower the crouching pose, raise the apex of my jump and give the landing a bigger impact. All in order to heighten the contrast in my poses and exaggerate the action. Now the Anticipation: I insert some breakdowns to help further define the action. Using breakdowns, I create a small rocking back as an anticipation to the main jump. Remember - anticipation is about signalling your audience that something is about to happen. The little rock back before the big jump is going to help the whole thing read more clearly. Finally I tweak the timing to "punch up" some areas (make them faster) or "soften" them (slow it down). I won't tweak timing too much while in stepped mode, as I find the switch to spline mode changes the perception of timing significantly. Next, I check the arc of the character's center of mass. There isn't an animation control that aligns with with the c.o.m, so I'll just animate a primitive sphere as a guide instead. Remember; this works similar to a bouncing ball. Once the character leaves the ground their lateral speed is linear and their up/down should be a nice symmetrical parabola. I'll slap an animated motion trail on the sphere to make it easier to visualize. If you haven't already, take a moment and read the online article; Alejandro Garcia: Physics and Balance. You want to be certain that you fully understand the concepts discussed therein. Once I have the arc and timing of the sphere working well, I reconcile the character to match it. I add a few more breakdowns to create a bit of a step back to accommodate the further lean back I needed (based on my sphere animation). Once the character is lining up with the sphere, it's on to polishing.First, I adjust my camera position to make sure I have the best possible staging (composition). Now that I know my view, I can track the feet so that their path of action is nice and smooth. Finally, I smooth out any hitches in the knees and I should end up with a nice convincing jump. Here's the final result, with added audio for fun. (Check out Freesound.org if you'd like to find some audio clips to add to your animation. WARNING: Anything handed in with an incorrect name will not be graded. 3dsMax files will not be graded.